then changes have to be made in both homes and business nationwide. 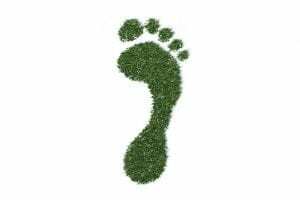 To put the thinking about what society has to do into action I've committed to having a net-zero carbon footprint (related to my personal life) in 2019. Carbon emissions from work-related long-haul travel are a separate question. So what does net-zero mean to me? Just looking up average NZ CO2 emissions per capita, and writing a cheque to cover carbon offsets for those emissions? Too easy! Throughout the year I'm going to be tracking the sources of carbon emissions related to my personal travel, food choices, household energy & waste etc. I'll share the results and will compare them to how things may have looked if I'd made different choices in the way I live. Step 1 was to find a carbon footprint calculator. My favourite - due it's local context is from Enviro-mark. However that left me a with a range of questions I wanted to probe more. What is the carbon impact of my vegetarian eating habit (of more than 25 years)? It's still a matter being debated. Buy local? Avoid food imported from far away? I am not giving up bananas or chocolate! There's some counter-intuitive things in the mix - such as NZ lamb exported to the UK having a lower carbon footprint than UK lamb. Does food need a carbon rating system to make things easier for conscious consumers? How much material do typical Kiwi homes really send to landfill? Our household would only send about 10 rubbish bags per year to landfill in weekly rubbish collections. Sounds like that is well below the average! I commute in a fully electric vehicle (a Nissan Leaf), often with one or two other passengers going to a similar destination - so while I do a lot of kilometres on our motorway system - that travel is not a major carbon emitter. There is definitely a carbon footprint involved in building any car, electric or otherwise. Life-cycle assessment done in the US showed the Nissan Leaf had the small life-cycle footprint of any vehicle in the American market in 2014. New Zealand has a high percentage of renewable electricity - so it's a great place to drive an electric vehicle. My year started with a flight back from an Australian holiday ... a carbon calculator has that trip at 0.19 tonnes of CO2. So it's one of the first entries in the spreadsheet tracking the impact of my lifestyle in 2019. There's still a range of lifestyle choices that create emissions, for example the use of the internet. I've used the Ecosia search engine for quite a while - it is a social enterprise which reinvests a significant portion of profits in tree-planting around the world. Click here for a review of Ecosia. I average 10 or so Ecosia searches per day. Ecosia claim it takes around 45 searches to plant a tree. So my search history may have planted a few trees so far this year. I'll have to decide how to count that. I acknowledge that carbon offsetting may not be a perfect solution - but not offsetting carbon is also imperfect. Around the house I would always first consider reducing/reusing/recycling/rotting (composting) to manage both consumption and waste. However this year I am going to be combining that with purchasing carbon offsets (from Enviro-mark or Ekos) to make a more significant change in the level of emissions I am responsible for. Research from the UK (see reference 4) shows carbon emissions are correlated with personal disposable income. In the UK people in the top income decile have three times of the emissions of the lowest decile. I can't find similar data for NZ, but I suspect the trend would be the same. That means those in the upper income deciles arguably have the greatest scope to make the largest change. In the UK data set, if everyone in the top two income deciles achieved net-zero emissions, then overall emissions from UK society would drop by 30%. So I'll be playing my part and will be going net-zero this year. Stay tuned and I'll share what that looks like. Posted in Uncategorized and tagged CO2 footprint, electric cars, electricity, net-zero on February 16, 2019 by rarc002. Like many New Zealanders I was (till July last year) the owner of an older car (I won't say how old!) that had a lot of kilometres on the clock. When it came time to change vehicles I decided to "walk the talk" and buy an electric car. I took the plunge and bought a second hand Nissan Leaf - and it was "love at first drive". The car is very quiet, accelerates beautifully and is generally fun to drive. There's no petrol engine in the car, and it charges overnight (in about 6 hours) from a household plug (with a higher current "caravan" socket). So does "driving electric" make sense? 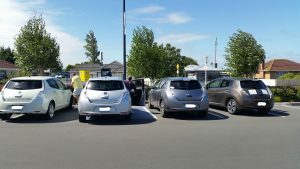 There were about 1,250 electric vehicles registered in NZ when I bought mine - today there are more like 2,250 (see www.driveelectric.org.nz for current stats). That means more and more NZers think it does make sense. 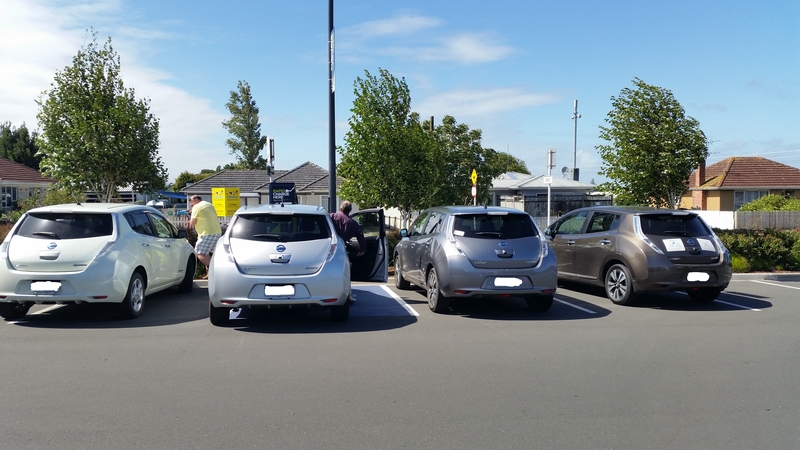 Nissan Leaf vehicles charging at a Vector charging station in Takanini. Mine was headed on a day trip further south that day. "Across the lifecycle, pure EVs have around 60% fewer CO2 emissions than petrol vehicles. When we just look at the CO2 emissions from use, New Zealand’s high proportion of renewable electricity generation means EVs have around 80% fewer CO2 emissions when driven in New Zealand. As the renewable proportion of New Zealand’s electricity continues to grow, the CO2 emissions from an EV will reduce further." EECA's research also dispels concerns re net environmental impacts associated with lithium production for electric vehicle batteries. So what's the catch? The typically advertised range of my model of Nissan Leaf, with its 24 kWh battery capacity, is 125 km on a full charge. That assumes driving on the flat on smooth roads etc. - so in reality I get less commuting range than that since we live at the top of a long winding hill. I have a fairly significant commute so I charge the car every night at home. What happened to my power bill? I opened the first one with bated breath! However the car's energy demands are relatively modest - so I traded filling up on a full tank of petrol every week, for an increase of $20 to $30 on my monthly power bill (I have a discounted rated for night rate electricity, and also have solar panels on the roof of my home that help charge the car when it's home at the weekends). Colleagues in the Department are interested in supporting NZ's transition to more electric vehicles. We've had a student project building web-based mapping tools that assess the viability of the use of an electric vehicle in Auckland for commuting taking into account speed limits and terrain (note that driving downhill regenerates charge in the car battery). The tool is not quite ready for public use but I looked forward to seeing it deployed. Companies such as Vector are deploying fast chargers that will charge a car like mine in 20 minutes or so. Their chargers are currently free for public use, but that will change at some point. The Government, via EECA are also trying to accelerate the transition to electric vehicles, via the Low Emission Vehicles Contestable Fund. So, a longer post than usual, but I have a lot of love for driving electric! Posted in Uncategorized and tagged EECA, electric cars, energy, Vector on January 23, 2017 by rarc002.